“Ecosystem” is a word that gets thrown a lot in the tech industry but there is a definition of this buzzword which is actually worth your attention. Digital ecosystems, or business ecosystems, are a model in which traditional industry boundaries are radically reordered, where sectors that once seemed disconnected fit together seamlessly and where users, their data, and businesses are part of a large co-dependent machine, according to a McKinsey analysis titled “Competing in a world of sectors without borders.” The report shows how China’s tech giants are developing this model and setting an example for global players. The term business ecosystem was coined by James F. Moore who studied the co-evolution of social and economic systems. It is now widely adopted in tech companies but it is quietly seeping into other areas. The model is a good reference for China’s digital landscape. Consider Alibaba—it can be defined as a retailer and a financial company. It has cloud technology, logistics, entertainment, healthcare, and even maps. It’s O2O, B2B, B2C, C2C and probably every other acronym you could think of. Alibaba, of course, is not the only example, other companies in China such as Tencent and Baidu, and even insurance company PingAn are building their own ecosystems. PingAn has moved on from insurance to financial services to AI development, and it has also created the PingAn Good Doctor app that connects patients with doctors. China’s tech giants owe their turbo-charged rise to unique regulatory, demographic, and developmental conditions. They were founded at a time when the efficiency of the traditional industries was low: e-commerce gained massive user number because classical retail was underdeveloped; delivery companies expanded because of the unreliability of China Post; healthcare apps gained momentum because of the inefficiencies of the healthcare system; mobile payments took the population by storm because plastic never had time to gain traction. By not being defined or constrained by a single industry, Chinese tech companies have accelerated the blurring of the borders between areas such as these. 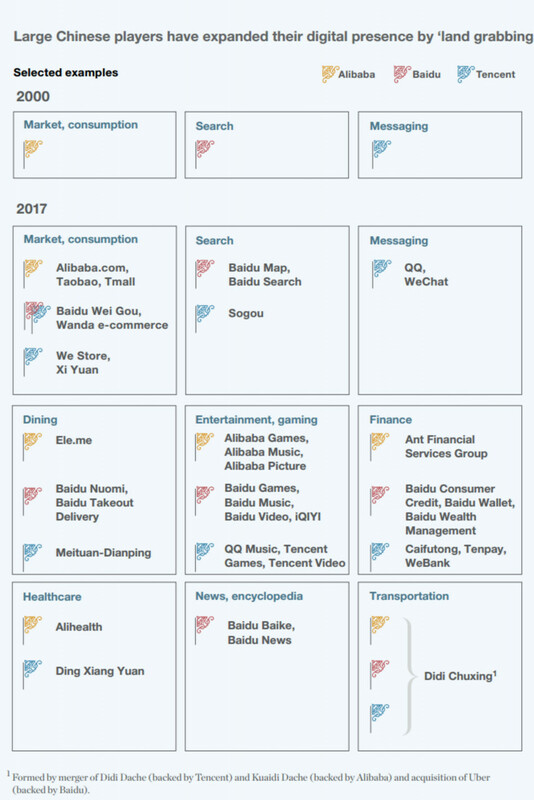 Much like WeChat which has become “the everything app” by joining social media, content, shopping, and more, these companies are trying to become “the everything company,” simultaneously competing in multiple sectors. Screenshot from McKinsey Quarterly 2017. Emerging markets like China are a good starting point for developing cross-industry ecosystems because businesses and expectations are not as defined as they are in more developed countries. But similar paths are being taken around the world. Japan’s Rakuten Ichiba has online stores, runs Viber, offers e-money, credit cards, and even travel. Amazon has launched Amazon Go store, acquired Whole Foods, and is providing vehicle searches in Europe. Telecommunication companies Telstra and Telus are combining tech and healthcare. Ford is redefining itself as a mobility company, not just a car-maker. With the help of AI and big data, these companies are creating ecosystems that enable users to access all kinds of products and services through a single gateway. Companies like these may seem like outliers today, but they are already changing the face of the economy. McKinsey recently asked 300 CEOs worldwide in 37 sectors about advanced data analytics. It turned out that one-third of them have considered cross-sector dynamics while many of them stated that they worry that companies from other industries have clearer insight into their customers. The new model is threatening to sweep the floor under certain (not all) traditional industries—soon they will have to face competition from companies and industries that they previously never considered rivals. 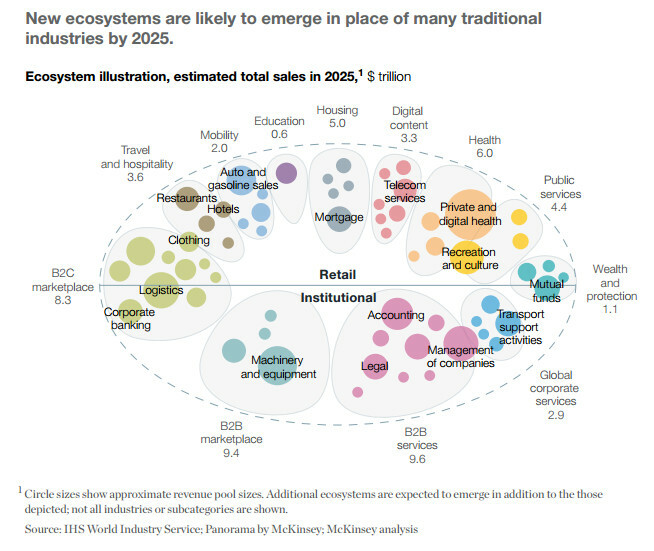 In the future, companies will define their business models not by how they play against traditional industry peers but by how they can stand against ecosystems. The report suggests that within about a decade 12 large ecosystems will emerge in retail and institutional spaces. It advises companies to follow data insights, build emotional ties with customers because they will bring more customers, and diversify company partnerships. It also warns that for many companies the attempt at creating an ecosystem has been a costly failure. But the report does not mention how the economy will look like when these massive, multi-industry ecosystems rise. What will the era of digital ecosystems and tech-based conglomerates bring us as consumers? For now, it is hard to predict outcomes. It is quite certain that ecosystems will offer more convenience and better solutions, but it is also imaginable that they will bring us more walled gardens, more antitrust lawsuits such as the one Google faced in the EU, and even bigger data privacy concerns.